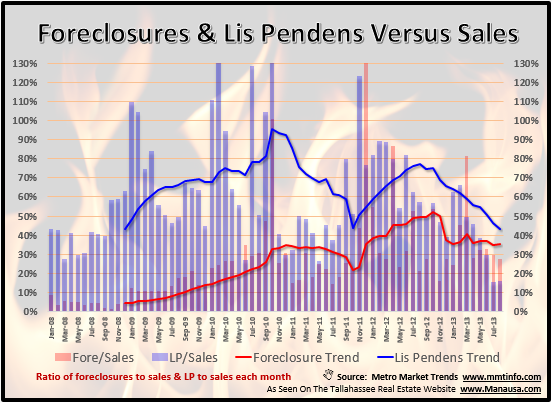 The latest data on Tallahassee foreclosure sales is mixed, with the current trend of declining foreclosures being offset with a slight year over year rise in new lis pendens filings. When we discuss distressed properties in Tallahassee, we measure three very important phases of the foreclosure process. The first step in a foreclosure is the filing of the legal documents, which is called the lis pendens. A middle stage that often occurs is the sale of the property before it makes it to a foreclosure sale. This could be a market sale or a short sale and these are typically referred to as pre-foreclosure sales. The final stage in Tallahassee foreclosure sales is when the property changes ownership at public auction. Often times, this is merely the bank taking ownership of the property which will result in a future sale to a new homeowner. By measuring both lis pendens filings as well as foreclosure sales, we can anticipate their future impact on the Tallahassee real estate market. While the list of foreclosure properties in Tallahassee is bloated, the number of properties has been on the decline for nearly a year. The number of lis pendens filings had been falling and the number of foreclosure sales is on the rise. The real estate graph below shows the average number of Tallahassee foreclosure sales has trended down to just above 40 (35% lower than at the peak last year). 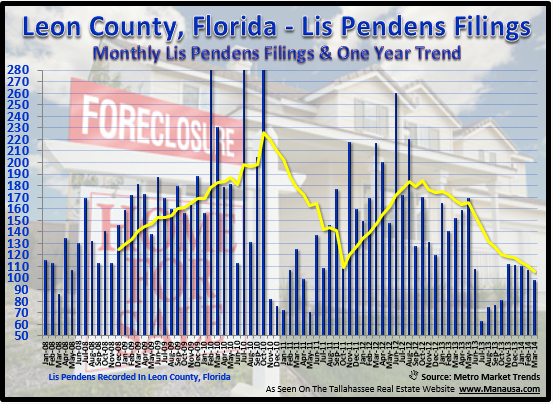 Lis pendens filings had been falling since January of 2010, when the number reached 188 and the trend was nearly 170 filings each month. Unfortunately, last month saw a slight rise, though the trend is still 50% lower than the peak reached in December 2009. Whether this is a sign of renewed filings by lenders, or just a small blip in the recovery remains to be seen. By monitoring lis pendens in Tallahassee, we will always be ready to anticipate future Tallahassee foreclosure sales.